Box Text: A Lot of Trouble is Popping up at The Warner Bros. Studio! The movie sets of "Bungle in the Jungle," "Space Wars," and "Remember the A La Mode" to name a few are completely overrun by hilarious hijinks, power-ups and crazy traps like catapults, runaway trains, giant boulders and smart bombs. Key props from each set, such as the hat of Dirk Rugged, the Bad Guy space helmet and the sheriff's badge, are missing in action. Rumor has it that the Warner Brothers (and the Warner sister, Dot) are up to their old tricks again. "Helllooo nurse!" Don't let anything distract you from collecting all the props. 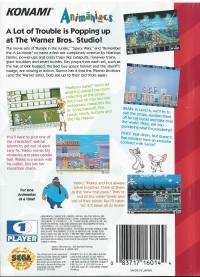 You'll see all your favorite Animaniacs characters like Dr. Scratchansniff, The Nurse, Mindy, Buttons and the Hip Hippos. BRAIN: In Level 6, we'll try to nab the props, auction them off for big bucks and take over the world. Pinky, are you pondering what I'm pondering? PINKY: Yeah Brain, but doesn't that reindeer have an exclusive contract with Santa? You'll have to pick one of the characters' special talents to get out of each zany fix. Yakko moves big obstacles and plays paddle ball. Wakko is a smash with his mallet. Dot has her irresistible charm. Yakko, Wakko and Dot always travel together. Think of them as the "New Brat Pack." They're out of the water tower and out of their minds! 02-20-2018 tripredacus Box Text A Lot of Trouble is Popping up at The Warner Bros. Studio! The movie sets of "Bungle in the Jungle," "Space Wars," and "Remember the A La Mode" to name a few are completely overrun by hilarious hijinks, power-ups and crazy traps like catapults, runaway trains, giant boulders and smart bombs. Key props from each set, such as the hat of Dirk Rugged, the Bad Guy space helmet and the sheriff's badge, are missing in action. Rumor has it that the Warner Brothers (and the Warner sister, Dot) are up to their old tricks again. "Helllooo nurse!" Don't let anything distract you from collecting all the props. 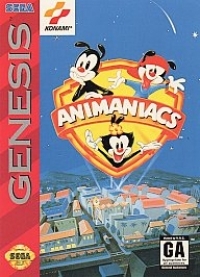 You'll see all your favorite Animaniacs characters like Dr. Scratchansniff, The Nurse, Mindy, Buttons and the Hip Hippos. BRAIN: In Level 6, we'll try to nab the props, auction them off for big bucks and take over the world. Pinky, are you pondering what I'm pondering? PINKY: Yeah Brain, but doesn't that reindeer have an exclusive contract with Santa? You'll have to pick one of the characters' special talents to get out of each zany fix. Yakko moves big obstacles and plays paddle ball. Wakko is a smash with his mallet. Dot has her irresistible charm. Yakko, Wakko and Dot always travel together. Think of them as the "New Brat Pack." They're out of the water tower and out of their minds! 05-15-2013 thomascozine Box Text A Lot of Trouble is Popping up at The Warner Bros. Studio! The movie sets of "Bungle in the Jungle," "Space Wars," and "Remember the A La Mode" to name a few are completely overrun by hilarious hijinks, power-ups and crazy traps like catapults, runaway trains, giant boulders and smart bombs. Key props from each set, such as the hat of Dirk Rugged, the Bad Guy space helmet and the sheriff's badge, are missing in action. Rumor has it that the Warner Brothers (and the Warner sister, Dot) are up to their old tricks again. "Helllooo nurse!" Don't let anything distract you from collecting all the props. You'll see all your favorite Animaniacs characters like Dr. Scratchansniff, The Nurse, Mindy, Buttons and the Hip Hippos. BRAIN: In Level 6, we'll try to nab the props, auction them off for big bucks and take over the world. Pinky, are you pondering what I'm pondering? PINKY: Yeah Brain, but doesn't that reindeer have an exclusive contract with Santa? You'll have to pick one of the characters' special talents to get out of each zany fix. Yakko moves big obstacles and plays paddle ball. Wakko is a smash with his mallet. Dot has her irresistible charm. Yakko, Wakko and Dot always travel together. Think of them as the "New Brat Pack." They're out of the water tower and out of their minds!